At Horizon Vault and Monument we strive to create a positive experience in helping you determine which burial options are best for you and your loved ones. From vaults and headstones to granite benches and bronze markers, we provide only the highest quality materials to ensure a lasting and unique tribute to your loved ones that will last for generations to come. At Horizon Vault and Memorial, if you can dream it, we can build it. Of course structural stability is a key factor in that, but with our advanced manufacturing processes, our clients can combine any number of elements they see and like into one unique representation of their loved ones’ life. Every individual’s life is unique and special, and should be celebrated in a way that best conveys the spirit and memory of that person. We specialize in both pre-need and at-need monument designs and vault orders. In a pre-need situation families and loved ones come together to plan for their eventual passing and make arrangements ahead of time to ensure the least amount of stress, confusion and cost for after they’re gone. This is a great way to ensure that the design and products chosen match the wishes of the person whom they’re for and lifts the burden of uncertainty and doubt that is often left after a passing. Of course death can not always be planned for, and we at Horizon Vault and Monument take special care to make sure the process of choosing arrangements for your loved ones is as stress free and straight forward as possible. 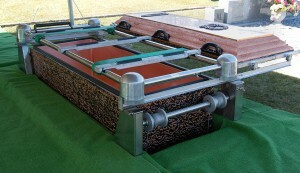 A burial vault is an important way of ensuring the integrity and durability of the casket. Here at Horizon Vault we only use vaults from trusted and quality suppliers like Wilbert. By using trusted manufactures you are guaranteed that the standards of production and reliability of the product is of the highest degree. At Horizon Vault and Monument, we are proud to offer our vault display service at the graveside service, so the personalization and care put into picking the perfect vault can be fully appreciated as a tribute to the life of that person. When businesses, parks, cities or other non-burial memorial sites need signs and markers to signify the space in a way that is established, enduring and timeless, they can count on Horizon Vault and Monument to work with them to create the perfect insignia. Examples of our granite signs can often be seen at the entrances to parks, neighborhoods, businesses and cities. Bronze, granite and marble markers can often be seen in city squares, memorial benches and trees in public places, or historical markers on homes, businesses and schools. 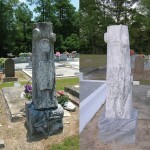 Over time, monuments and headstones can become worn by the elements and no longer have the clean, sharp appearance that they once did. This is why Horizon Vault and Monument offers burial site restoration services. We can clean, restore, move or change your loved ones’ current burial site to meet your satisfaction. Keeping the final resting site of your loved ones in top condition is a priority that can seem overwhelming, but we are here to help. As my own recognition and appreciation of their service to our country and the time that veterans have spent defending our freedom, I personally offer a free granite, bronze or marble marker for any veteran planning for their burial arrangements or those who have recently passed.